Design and construction professionals pay attention to what their peers are saying. You might never know what people are saying about your company or products when they gather around the office water cooler, but you can monitor their discussions in online social media. An excellent example of this is a recent exchange on the Construction Specifications Institute's group at LinkedIn.com where someone posted a question soliciting advice about window films that can be applied to glass for shading, safety, privacy, or insulation. "I would strongly suggest staying away from window film. You can end up voiding the warranty for the insulated glass unit (IGU) since it can overheat the airspace." In subsequent days, several other individuals gave qualified endorsements of films, but the tone remained, as one post put it, "don't use it on IGUs." "The "airspace" in a typical IGU is evacuated and replaced with an inert gas...typically Argon, but sometimes Nitrogen or other inexpensive inert gases. Inert is the key word...those gases are there to be an insulator and, as such, can't hold onto heat energy." He then went on to share guidelines for situations where films should not be used; his honesty about these demonstrates that he is a fair broker who can present a balanced appraisal of the product. He ends by offering assistance and giving his contact info. His answer seems to be the last word on the topic, as no one has challenged it in over two weeks. The forum automatically sends updates to individuals posting comments, so the people with concerns about films have the benefit of the reps knowledge. Further, anyone finding the conversation through an online search will benefit from his insight. Identify the social media channels used by potential buyers and specifiers. Then assign someone on your team to monitor each channel to seek opportunities and to protect against misinformation. Guide specifications should be in a digital format that is easy for for potential users to read and edit. Microsoft Word is the word processor most widely used architects and engineers. But there is a compatibility issue between versions of Word. Word 2007 and more recent versions create files with the .docx extension; prior versions use the .doc extension. While it is easy to convert from one format to the other, a document can become discombobulated. To find out which file format is most useful for guide specification, I posted a question on Linked In's Construction Specifications Institute (CSI) group. Within hours, I had my answer, demonstrating the power of social networks. With Word 2007 and later you can use either .doc or .docx formats. The problems happen when you go backward from Word 2007 .docx format to earlier versions of Word .doc format files. If you are preparing guide specifications you should use the .doc format; there are a good number of firms and people who are looking at your guide specifications who are still using older versions of Word and .doc files and who will go elsewhere if your files give them problems due to incompatibility with their word processing programs. This opinion was confirmed by other responses. Several voices in the group also remind us that some specification writers prefer WordPerfect, a program that uses the .wpd extention. WordPerfect can open and convert .doc files. .html so it can be read in a browser. .pdf so it can be readily printed without a word processor. .doc for use in Word. In most instances, however, using the old Word .doc format will delight most, and be serviceable to the rest of, specifiers. How can a building product manufacturer or sales rep stay in touch with architects that are working out of their homes and other unconventional business venues? 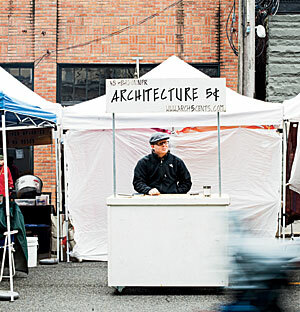 A recent post by Architectural Record discusses architects working out of storefronts and other unconventional locations as survival strategies during these tough times, including the one shown above who sets up his "Architecture 5 Cents" booth at farmers' markets. While architects have always been nomadic, moving from office-to-office as they hire then fire for big projects, the recent recession has made it even more difficult for manufacturers and sales reps to locate their prospects. 1. If you build relationships of trust and service with architects, they will call you when they need your products. 2. Ask architects for their personal contact info. Make it clear this is not to bombard them with spam, but to be able to contact them in the future, "if necessary." 3. Architects working alone or in small offices frequently seek out professional comradeship by attending professional society meetings, educational events, and local product shows. You can attend as well. 4. In a big office, there was always someone around to speak with or to get advice. Architects working from home increasingly go online for the same types of interaction. You need to, too. 5. Track them down using Linked In and other online resources.